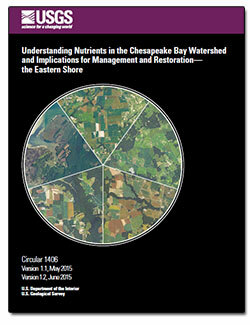 USGS Publications about the Water Resources of Maryland, Delaware, and D.C. This page contains a bibliographical listing of online publications from the Maryland-Delaware-D.C. Water Science Center of the US Geological Survey. To browse publications by subject or topic area, use the navigation buttons on the left. To browse publications in chronological order, click on a year below. For a comprehensive search of publications based on subject matter, author, etc. visit The USGS Publications Warehouse. To browse publications before 2010, visit the bibliography page. 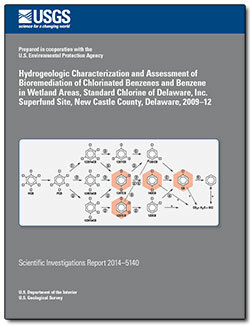 Abstract: From 1966 to 2002, activities at the Standard Chlorine of Delaware chemical facility in New Castle County, Delaware resulted in the contamination of groundwater, soils, and wetland sediment. 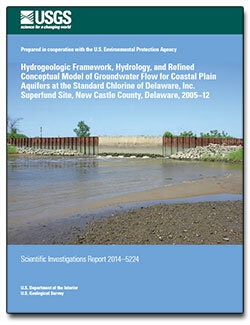 In 2005, the U.S. Geological Survey (USGS), in partnership with the U.S. Environmental Protection Agency, Region 3, and the Delaware Department of Natural Resources and Environmental Control began a multi-year investigation of the hydrogeologic framework and hydrology of the confined aquifer system. 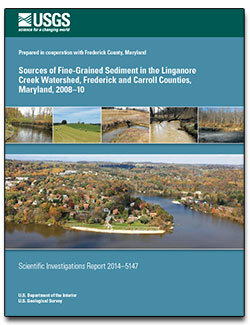 Abstract: Sediment fingerprinting and sediment-budget measurements were used in the agricultural and forested Linganore Creek watershed in Maryland to determine the sources of fine-grained sediment, as well as the amount of fine-grained sediment eroded from and deposited on streambanks, flood plains, channel beds, and agricultural and forested uplands. Management implications of this study indicate that both agriculture and streambanks are important sources of sediment in Linganore Creek. Abstract: Wetlands at the Standard Chlorine of Delaware, Inc. Superfund Site in New Castle County, Delaware, are affected by contamination with chlorobenzenes and benzene from past waste storage and disposal, spills, leaks, and contaminated groundwater discharge. In cooperation with the U.S. Environmental Protection Agency, the U.S. Geological Survey began an investigation to characterize the hydrogeology and geochemistry in the wetlands and assess the feasibility of monitored natural attenuation and enhanced bioremediation as remedial strategies. Abstract: The Eastern Shore includes only a small part of the Chesapeake Bay watershed, but contributes disproportionately large loads of the excess nitrogen and phosphorus that have contributed to ecological and economic degradation of the bay in recent decades. The disproportionately large nitrogen and phosphorus yields from the Eastern Shore to the Chesapeake Bay are attributable to human land-use practices as well as natural hydrogeologic and soil conditions. 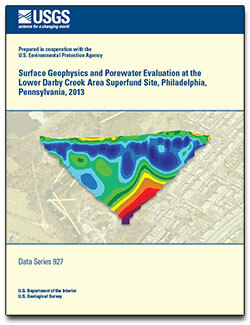 Abstract: In cooperation with the U.S. Environmental Protection Agency (EPA), Region 3, the U.S. Geological Survey (USGS) is participating in an ongoing study to aid in the identification of subsurface heterogeneities that may act as preferential pathways for contaminant transport in and around the Lower Darby Creek Area (LDCA) Superfund Site, Philadelphia Pa. The Lower Darby Creek, which flows into the Delaware River, borders the western part of the former landfill site. Brayton, M.J., Cruz, R.M., Myers, Luke, Degnan, J.R., and Raffensperger, J.P., 2015, Hydrogeologic framework, hydrology, and refined conceptual model of groundwater flow for Coastal Plain aquifers at the Standard Chlorine of Delaware, Inc. Superfund Site, New Castle County, Delaware, 2005–12: U.S. Geological Survey Scientific Investigations Report 2014–5224, 61 p.
Gellis, A.C., Noe, G.B., Clune, J.W., Myers, M.K., Hupp, C.R., Schenk, E.R., and Schwarz, G.E., 2015, Sources of fine-grained sediment in the Linganore Creek watershed, Frederick and Carroll Counties, Maryland, 2008–10: U.S. Geological Survey Scientific Investigations Report 2014–5147, 56 p.
Ator, S.W., and Denver, J.M., 2015, Understanding nutrients in the Chesapeake Bay watershed and implications for management and restoration—The Eastern Shore: U.S. Geological Survey Circular 1406, 72 p.
Lorah, M.M., Walker, C.W., Baker, A.C., Teunis, J.A., Majcher, E.H., Brayton, M.J., Raffensperger, J.P., and Cozzarelli, I.M., 2014, Hydrogeologic characterization and assessment of bioremediation of chlorinated benzenes and benzene in wetland areas, Standard Chlorine of Delaware, Inc. Superfund Site, New Castle County, Delaware, 2009–12: U.S. Geological Survey Scientific Investigations Report 2014–5140, 89 p.
Ator, S.W., Denver, J.M., LaMotte, A.E., and Sekellick, A.J., 2013, A regional classification of the effectiveness of depressional wetlands at mitigating nitrogen transport to surface waters in the Northern Atlantic Coastal Plain: U.S. Geological Survey Scientific Investigations Report 2012–5266, 23 p. First posted January 30, 2013. Jonathan J. Gourley, Yang Hong, Zachary L. Flamig, Ami Arthur, Robert Clark, Martin Calianno, Isabelle Ruin, Terry Ortel, Michael E. Wieczorek, Pierre-Emmanuel Kirstetter, Edward Clark, and Witold F. Krajewski, 2013: A Unified Flash Flood Database across the United States. Bull. Amer. Meteor. Soc., 94, 799–805. Gellis, A.C., Noe, G.B., 2013, Sediment source analysis in the Linganore Creek watershed, Maryland, USA, using the sediment fingerprinting approach: 2008 to 20101: Journal of Soils and Sediments: Assessment, Protection and Remediation (ISSN 1439-0108), 21 p.
Chanat, J.G., Miller, C.V., Bell, J.M., Majedi, B.F., and Brower, D.P., 2013, Summary and interpretation of discrete and continuous water-quality monitoring data, Mattawoman Creek, Charles County, Maryland, 2000–11: U.S. Geological Survey Scientific Investigations Report 2012–5265, 42 p.
Dieter, C.A., Koterba, M.T., Zapecza, O.S., Walker, C.W., and Rice, D.E., 2013, Hydrogeologic framework, hydrology, and water quality in the Pearce Creek Dredge Material Containment Area and vicinity, Cecil County, Maryland, 2010–11: U.S. Geological Survey Scientific Investigations Report 2012–5263, 219 p. First posted January 17, 2013. Clune, J.W., and Denver, J.M., 2012, Residence time, chemical and isotopic analysis of nitrate in the groundwater and surface water of a small agricultural watershed in the Coastal Plain, Bucks Branch, Sussex County, Delaware: U.S. Geological Survey Scientific Investigations Report 2012–5235, 15 p. First posted December 6, 2012. Curtin, S.E., Andreasen, D.C., and Staley, A.W., 2012, Potentiometric surface and water-level difference maps of selected confined aquifers of Southern Maryland and Maryland’s Eastern Shore, 1975–2011: U.S. Geological Survey Scientific Investigations Report 2012–5165, 36 p.
Fleming, B.J., Hammond, P.A., Stranko, S.A., Duigon, M.T., and Kasraei, Saeid, 2012, A science plan for a comprehensive assessment of water supply in the region underlain by fractured rock in Maryland: U.S. Geological Survey Scientific Investigations Report 2012–5160, 29 p.
Banks, W.S.L., Masterson, J.P., and Johnson, C.D., 2012, Well Network Installation and Hydrogeologic Data Collection, Assateague Island National Seashore, Worcester County, Maryland, 2010: U.S. Geological Survey Scientific Investigations Report 2012-5079, 20 p.
Dieter, C.A., Campo, K.W., and Baker, A.C., Groundwater Quality and Occurrence and Distribution of Selected Constituents in the Aquia and Upper Patapsco Aquifers, Naval Air Station Patuxent River, St. Mary’s County, Maryland, July 2008: U.S. Geological Survey Scientific Investigations Report 2012-5011, 16 p.
Banks, W.S.L., and Johnson, C.D., 2011, Collection, Processing, and Interpretation of Ground-Penetrating Radar to Determine Sediment Thickness at Selected Locations in Deep Creek Lake, Garrett County, Maryland, 2007: U.S. Geological Survey Scientific Investigations Report 2011-5223, 36 p.
Ator, S.W., Brakebill, J.W. and Blomquist, J.D., 2011, Sources, Fate and Transport of Nitrogen and Phosphorus in the Chesapeake Bay Watershed: An Empirical Model: U.S. Geological Survey Scientific Investigations Report 2011-5167, 27 p. Published October 11, 2011. Fleming, B.J., DeJong, B.D., and Phelan, D.J., 2011, Geology, Hydrology, and Water Quality of the Little Blackwater River Watershed, Dorchester County, Maryland, 2006—09: U.S. Geological Survey Scientific Investigations Report 2011—5054, 82 p. Posted May 2011. 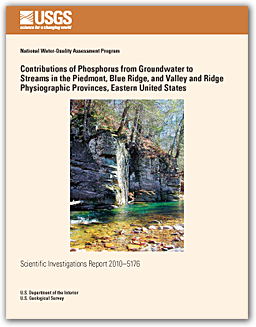 Denver, J.M., Cravotta, C.A., III, Ator, S.W., and Lindsey, B.D., 2010, Contributions of Phosphorus from Groundwater to Streams in the Piedmont, Blue Ridge, and Valley and Ridge Physiographic Provinces, Eastern United States: U.S. Geological Survey Scientific Investigations Report 2010—5176, 38 p. Published January 20, 2010.